Our trip from Moorea to Raiatea was uneventful and due to the very light winds (which are unusual), we had to motor almost the entire 100 or so miles. We entered through the Iriru Pass which is also know as the 'Sacred Pass' and dropped anchor in Hotopuu Bay. Just immediately north of us is the Marae Taputaputea, the most important religious and historical site in all of Polynesia. There are actually several marae there. 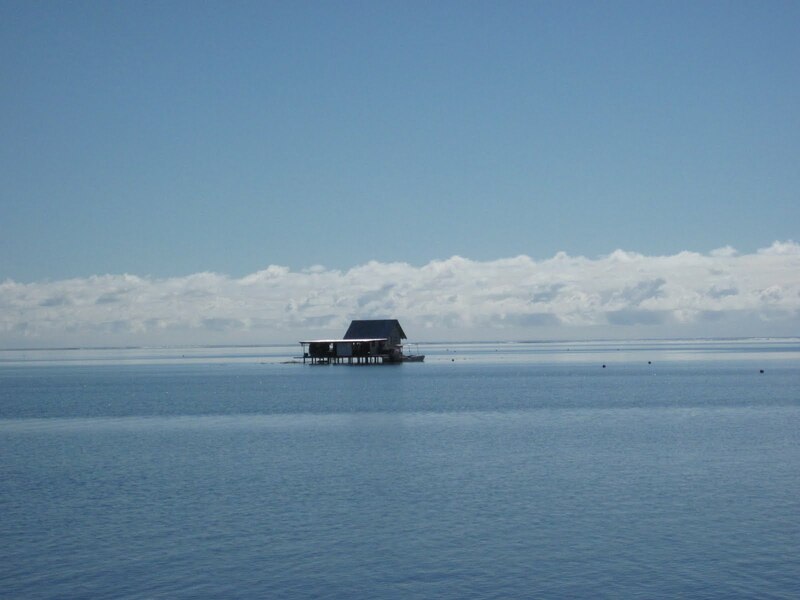 Marae are ancient ceremonial or gathering areas made of coral. The following day we stayed inside the lagoon, motored north about five miles and anchored just off Iriru Island. It's right by the Iriru Pass and Corie was able to get some surfing in. Our friends on Songline were on their way to Bora Bora but we not-so-subtly twisted their arms over the radio and convinced them to turn around and spend a couple of days with us. When our other friends on Libis heard that Songline was heading our way, they decided to head over, too. We had a great happy hour on board Rutea with much laughing and teasing. Libis is a Dutch boat and both Gela and Fluer speak several languages fluently. 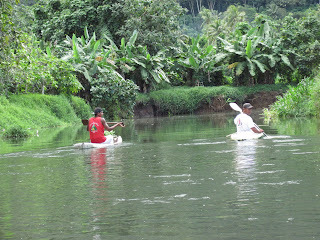 Our guide book told of a dinghy ride to the end of a long bay and then up a river. Our friends on Mystic said that they had done the same trip and they'd meet a man named James who showed them botanical gardens and gave them fresh fruit. With Fred and Cinda from Songline in our dinghy and Gela and Fluer in their dinghy, we headed up Faaro Bay, which is more than a kilometer long. At the head, we found the river mouth and with wisecracks about the Jungle Cruise at Disneyland or, worse, the movie Deliverance, continued to motor into the jungle. The river was slow-moving, very narrow in parts, mostly deep enough for the dinghies and both sides heavy with dense jungle. Every so often we'd come across a ramshackle house but for the most part it seemed as though we were far from any civilization. Sometimes the growth over the river was so thick that it blocked out the sky. As the river got narrower and more shallow, we tilted up the outboards and paddled - eventually we wound up using the paddles as poles to move us along. 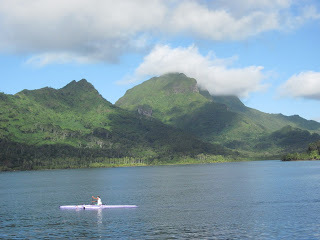 We reached a point where it was too shallow to go further and just as we were to turn around, a man in a Tahitian canoe and a much younger man on a sailboard (with no rig or sail) appeared. "Are you James?" Ruthie asked. The man, who appeared to be about 40, said he was. He was wearing shorts and a t-shirt, no shoes. The most remarkable thing about him was his speech. He spoke rapid-fire English with a heavy accent but he was almost impossible to understand. "Can you show us the gardens?" someone asked. 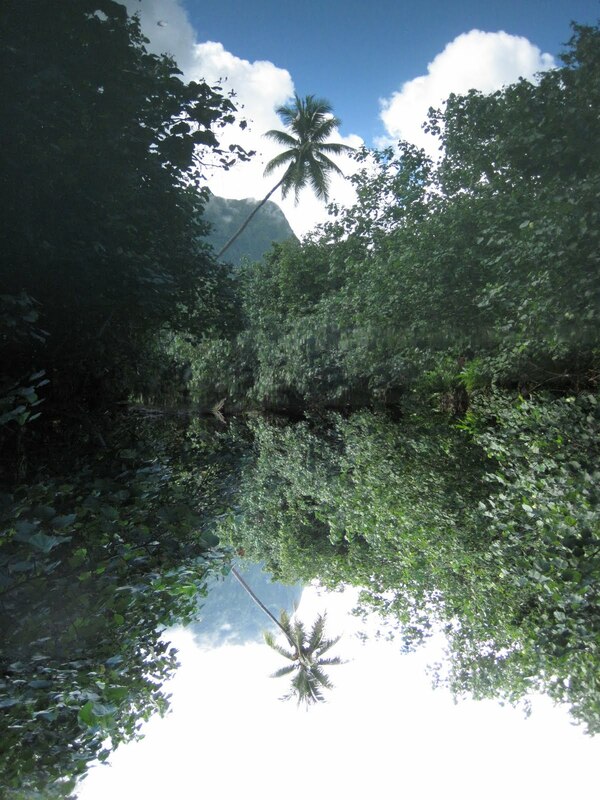 "GoodformegoodforyougoodforPolynesia," said James. We looked at each other stupidly. "Can you get us some bananas?" someone else asked. "Notgoodformegoodforyou," said James, making a motion with his had in front of his stomach resembling that of a pregnant woman. He started to paddle away and motioned for us to follow him back down the river. He stopped at one point and we pulled over as well and asked something about bananas. I did my pantomime of a large stalk of bananas and James climbed into the jungle. With a few whacks with his machete, down came the entire banana tree, just missing us in the dinghy and he chopped off a stalk of bananas that was over four feet long. Granted, I had motioned that I wanted a big stalk of bananas but this was huge! Quickly, I asked Fluer to tell him, in French, that one stalk would be enough for all three boats but we were too late. Whack! Whack! 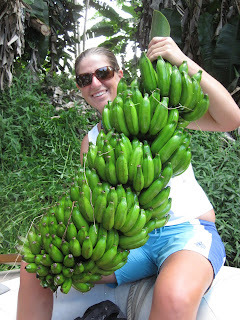 Another banana tree fell and Libis, too, had an impressive banana stalk. Still another tree fell but this stalk he gave to the young man on the sailboard (who's name turned out to be Bruno). We continued down the river and turned up a small creek and anchored the dinghies. James almost never stopped talking, hardly even taking a breath, in his unintelligible monologue. 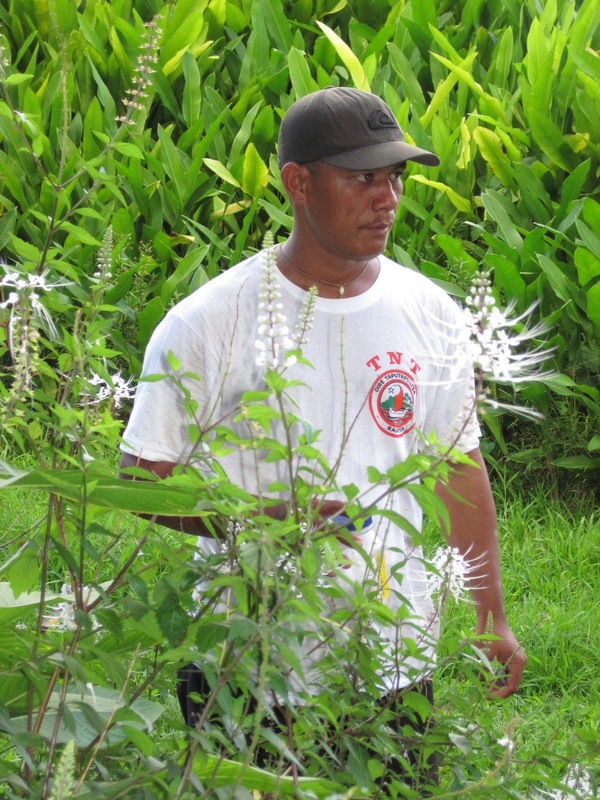 One exotic plant or flower after another, James would prattle on: "Plantationsmartpoisonousnotgoodformenotgoodforyou." Slowly, we started to catch on as we walked through the 'botanical garden' which was nothing more than a few paths through the jungle. We ate fruits that looked like the stickers on the sweet gum tree except that they were bright red. We ate star fruit and sucked the nectar out of flowers. James showed us how to climb a coconut palm. I didn't even try but Gela was able to scamper to the top as if he'd been doing it all his life. The whole time Bruno kept the rear guard but never spoke. With the garden tour over, we got back in the dinghies, James into his canoe and Bruno back onto the sailboard. We went further downstream and pulled over at small dock. James went back up a coconut tree and soon returned with with an armload of coconuts of which he chopped the tops off and gave to us to drink the sweet milk. I gave James some money, thanked him profusely and we headed back to our boats. That evening we had a potluck dinner aboard Rutea and had a great time trying to imitate James or just figure out what he was saying. Another great adventure.